Machine pieced crazy patchwork quilt in plain, floral and striped cotton materials. Some pieces are seamed and others are sewn direct on to calico backing. Each piece is outlined in red stranded cotton in herringbone stitch. 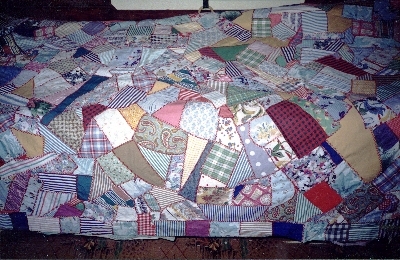 This crazy patchwork quilt was made by Jean Joyce in the 1950s when she spent many hours with her invalid husband. She gave it to her sister Joan Bolton who donated it to The Pioneer Women's Hut. It is displayed occasionally.